a newspaper man. As the first woman elected to the United States senate from the state of Minnesota. To announce my candidacy for president of the United States. 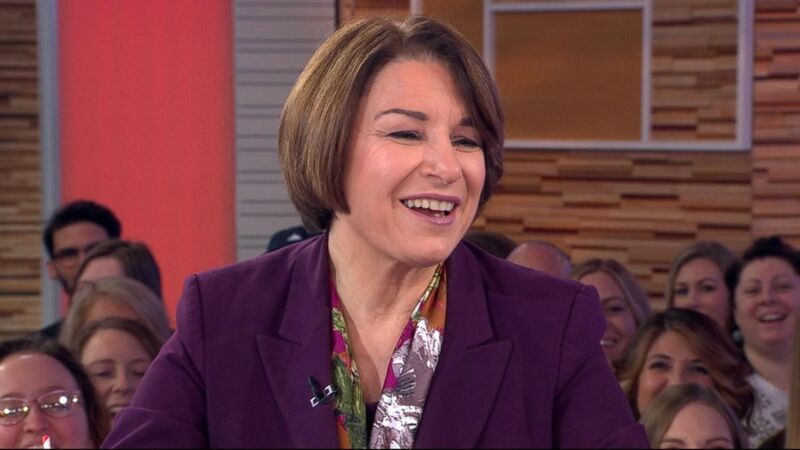 There you see Amy klobuchar. A very snow win day. We saw you push those words out. What does it feel like to say that? I’m running for president of the United States? It feels like major burden that you have to do this right. You have to get to the point where you decide, I’m going to go through this. Our nation is tired of being governed by chaos. We need to be governored by opportunity. It will be a huge democratic field. Running for the chance to run against president trump. What do you bring too? The race that no one else is offering? That only you are bringing? Snow. I bring — I bring a background of growing up in the heartland. I bring some grit to the race. That comes from being the granddaughter of an iron other miner and a daughter of a teacher and a nooup man and someone who has risen to the challenges every time I get a job. I did that as prosecutor for eight years. I did that in the senate. The president signed in the last two years 35 of my bills that I have led or been the lead Democrat on. I like to get things done. I think finally, I don’t think anyone is talking enough about the challenge that are the challenges of our day. These are challenges like the digital disruption. And the changes it’s making to the work force. The need for privacy laws. And no one is willing to take on the tech companies. I am. The need to do something about prescription drugs. I guess to the state of the union — my guest to the state of the union has a season who had to ration his insulin because it was so expenexpensive. And he ended up dying. We have to bring down prescription drug prices. We have to do something about climate change. The president, that caught the president’s eye yesterday. You probably saw the tweet. I’m sure you saw the tweet right after you were announcing. Saying you’re out there faug talking about fighting global warming while standing in a blizzard of snow. Bad timing. By the end of her speech, she looks like a snowman. Snowwoman. You have your nickname. Snowwoman? That could be so much worse. We know climate change is happening. Just this last year, it was one of the fourth hottest years in the history of the world. That’s what’s happening right now. We see this Greenland ice sheet melting. Look at the wildfires in Colorado and California. Where you would have a dad trying to get through a fire trying to calm his kid down in a car. That is what’s happening in this country. I think we can’t ignore it. What I said to him back was, when he called me a snowwoman, I would like to see how his hair would fare in a blizzard. You just answered my next question. I was going ask, you know, he posed challenges to Hillary Clinton. She never quite figured it out. How do you handle things like the tweets? Things like being called names? First of all, you don’t go down the rabbit hole with everything he says. You have to have your own optimistic agenda. Hillary had that. It got lost in the campaign. You have to pick your battles with him. And I think you have to use some humor, like I got to do yesterday, right away. Because, you just can’t take everything seriously. He’s trying to get into every story that you have. You have to set your own agenda. We need to cross the river of our divides. As I stood before the snowy Mississippi river. America’s greatest river. We have to kros a river on our divides. Walk over America’s sturdy bridge to a higher ground. One of the raps on you is that you’re a tough boss. High staff turnover in the senate. What do you think is fair about that criticism? And what have you learned from it? Well, first of all, I love my staff. I wouldn’t be where I am. And we wouldn’t be able to do all that work and pass all those bills if we didn’t have a great staff. I’m tough. I push people. That is true. My point is, I have high expectations for myself, for the people that work for me. And I have high expectations for this country. Are you ready for all the scrutiny that comes from running for president snmplgt yes, I am. I have grit. As you could see yesterday. Not everyone would have stood out there as I look like I was getting older by the mine out. Throughout my life, I have overcome adversity. Whether it was my dad struggling with alcoholism his whole life. My daughter being born — she couldn’t swallow. We didn’t know if she was going to live. She spent a year and half with a tube in her stomach. That’s how we fed her. We just kept going. We rose to that occasion. She’s now living in New York City. Has her first job. Great kid. Hope you get to have lunch with her today. Thanks for coming in this morning. Thank you, George.